Our top toys for Christmas 2015 is here allowing you to remove the risk of shopping online. We’ll bring you products we’ve tried and tested and that our child reviewers have loved. We want to help you make those little faces light up on Christmas morning and so we’ve only chosen those toys that will do just that. 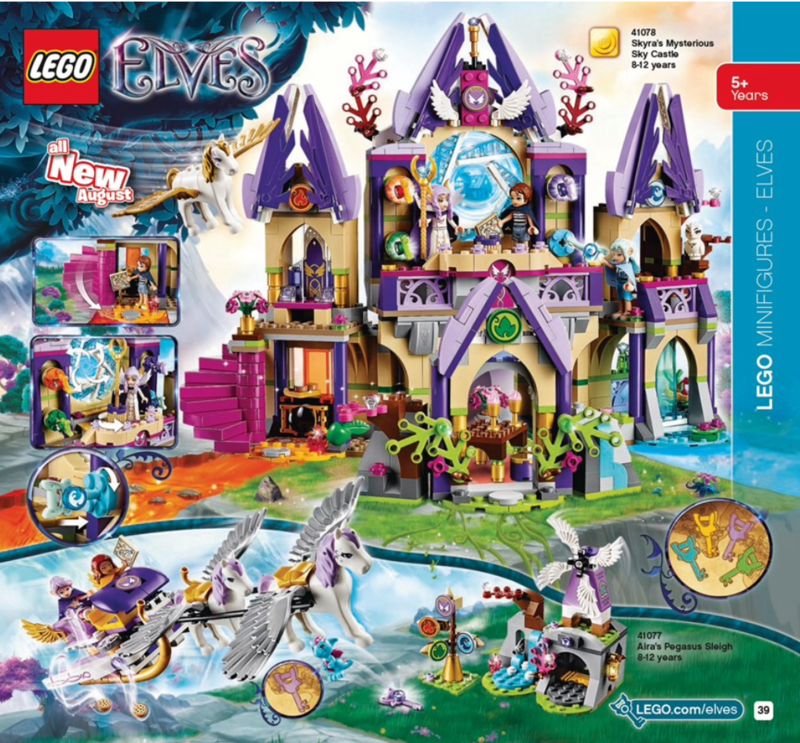 The new Lego Elves theme includes all you need to delight boys and girls along with some adults too. A touch of magic, some unicorns and Pegasus, secret hideouts and fairy dust. A wonderful idea from Lego and one that is an absolute delight for both genders. If you’ve watched Nickolodeon this year you will have seen this track advertised before any Peppa Pig. Sturdy and easy to put together it’s a great set as a first train set and perfect for little hands, while the twisty turvy rails add extra excitement. Bound to be a favourite as kids and adults play together on Christmas Day. A wonderful set that ticks lots of boxes from doctor role play to TV characters to Lego. Our little ones loved it and so did the older children. A must for any girl (or boy) this Christmas. Build and explore the DUPLO Disney Sofia the First™ Royal Castle with Sofia, Princess Amber and Clover the rabbit. Princess fun and magical surprises await around every corner. Accessories include golden magic wands, sleeping blankets, treasure chest, jewel brick and crest, chandelier and windows with decorated bricks. Still the best interactive toy for encouraging young ones to read independently. This year it has new books such as Sophia the First above. A must for any child between the ages of 3 and 6. LeapReader is the perfect gift if you’re looking for a complete system to help children with their reading, writing and listening skills. Touch the pen to LeapReader books to hear the words read aloud and sound out the words, or use the special no- mess paper to practise letters, numbers and words with stroke-by-stroke guidance. LeapReader even plays vocabulary building games, and the fun character voices, sound effects and activities all help with comprehension skills. With over 40 educator approved books, apps and activity sets, including some of your children’s favourite characters, like Nemo and the cast of Cars, LeapReader is the ideal system that will keep children learning and having fun at every reading stage. If you’re travelling to family this Christmas these little stocking fillers are ideal to keep children entertained in the car. We all loved them and now don’t do a journey without them! A series of activity cards in a designed tin box– each set includes 20 brilliant ideas and games. Each design includes 20 cards. · With your grandparents: Take the quality time with your grandparents to the next level with these tailored activities! · On the way: Who said driving in the car must be boring? Let the fun begin with these 20 great ideas and games for the road. If these don’t provide enough inspiration take a look back at last year’s top toy from The Consumer Voice! What on Earth? Wallbook Timelines. Designed for curious children aged 7 to 16, each title feature an illustrated pull-out timeline which chronologically recounts every pivotal event that’s ever happened since the dawn of time on that particular subject. The Wallbooks are available in 5 titles – Science, Nature, History, Sport and Shakespeare and available from the National Hiostory Museum. They are the perfect present for parents who want to give their children, niece, nephew, friends kids a fascinating and useful gift that they can keep referring to right through school years of KS2 and 3 – much more fun than your average information book. Loom bands are still all the rage and this full set is not only quite cheap it has everything a loomer needs. It’s also HUGE don’t let the image fool you this is one heavy large gift. You’ll find it creates lots of curiosity before the day, that’s if you have space under the tree for it. We love a bit of science here at TCV can you tell we tend to stay away from technology? When it comes to toys we want ones that let us play too! In fact this tornado maker is so cool, the adults played with it before the children, we love it and know you will too! This is huge and has every animal you need to have hours of fun and role play. It’s bound to be a firm favourite on Christmas Day. Playmobile are coming out with some excellent toys lately and many have special offers on such as the school yard which is half price at Home Bargains. For toys that get the imagination flowing you can’t go far wrong with Playmobile. Ok, this maybe more for the adult kid in your life but it really is a fantastic concept. The book allows you to build your very own double decker bus. Great for sending to friends overseas, as not only does it have a British feel, it’s also easy to post. We suggest you keep an eye on Tobar as they have some really great stocking fillers, this is just one example of those. Simple sewing kit to make a soft pony that’s ideal for beginners. All of the felt pieces come pre-cut in the shapes necessary to complete the project. Follow the easy instructions and sew the pieces together using the needle and thread included in the set. The box contains felts, thread, yarns, buttons, ball lace, googly eyes, a needle and stuffing. If you’re really stuck for ideas, pop over to our sister site Sunday Woman for more Christmas gift guides or see this website, What2Buy4Kids.co.uk . We popped over and found this make your own chocolate pizza kit which was a huge hit! For more gift guides see our sister site, Sunday Woman.